Welcome to Welsh-Holly - one of the few specialist holly nurseries in the UK. We are really pleased that you, too, are a keen enthusiast!! 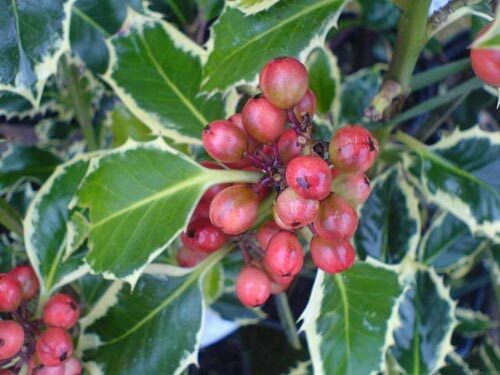 We stock all sorts of holly - ornamentals, both silver and gold variegated; hollies with red berries, hollies with orange berries; hollies with unusual leaves; hollies with interesting names; rare and unusual hollies; hollies for your neighbours to see and envy, and hollies to provide privacy. Even hollies without prickles on the leaves. Now's the perfect time to start planning and planting your new holly hedge. Apart from looking attractive throughout the year, it's excellent for security. If you'd like some advice on the best plants to chose or how many you need, drop us an email. As always, we are more than happy to answer any questions you might have regarding holly - for instance, choice of plant, position, spacing etc etc - so please email, regardless of whether you are buying from us or not. We are always developing our stock of hollies so, if the one which you are looking for is not listed, please contact us anyway, because it may be available shortly. These are inclined to vary, depending on the writer's observations. For example, when we recently reviewed articles on Ilex “Belgica Aurea”, it was described as both “sparsely berrying with red fruits” and as “abundant large orange-red fruit”. We have taken a consensus view. The reasons for the variations probably depend on the site where the tree is growing. The amount of fruit a tree will bear depends on a variety of factors - soil, the season’s climate, drought stress (which seems to encourage berrying) and luck. All these factors combine such that one person’s experience is often very different to anothers. Decide what you like best - is it the berries - red (Van Tol), orange (Amber) or yellow (Bacciflava) ? Remember if you want berries, unless it is self-fertile (Pyramidalis) you will need a male tree within the area. 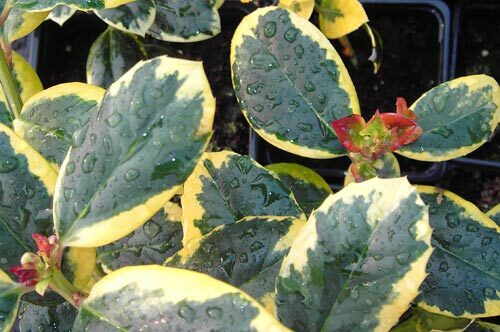 Perhaps you looking for an interesting leaf colour - if you like variegated, consider the colour - white through to cream . Decide on whether you prefer a coloured leaf margin (Silver Van Tol) or a coloured centre (Lawsoniana). A dark green leaf , or perhaps a blue leaf (Blue Angel). Or look at leaf shape - small pointed leaves (Myrtifolia) or Silver Hedgehog, with it’s prickly spines. And don’t forget the twig colour - a female Argentea Marginata has green twigs, while "Handsworth New Silver” has purple twigs. Is the tree shape your main interest? Consider “Alaska” for it‘s standard shape or what would a “Perrys Weeping Silver” look like in your garden? Be very careful about the names - Golden King is female and will have berries, while Silver Queen is male!!! Golden Milkboy is...... a male, while Silver Milkmaid is.....a female! Decide if you want one of the more popular ones (Madame Briot) or, to be different, one of the less common, but perhaps more interesting, ones such as Elegantissima . Maybe there are special considerations to think of - imagine the leaf colour of Flavescens as the glow of a setting summer sun lights it up!! Hollies will grow in virtually any soil, as long as they don’t have wet feet. Hollies will grow in the shade, but like you and me, they prefer some sun. And, because of their waxy leaves, they are very wind resistant, and ideal for exposed positions. Think carefully before you plant it so that you don’t have to move it again - hollies, once established, prefer not to be disturbed too much. Decide now whether you will keep it trimmed or whether you will let it grow to it’s natural height and shape. Try to visualize the final height. When planting, dig a straight-sided hole twice the size of the pot and 200mm deeper. Mix the topsoil with well-rotted manure or leaf mould, put some in the hole. Place the tree in the hole, backfilling and gently compacting as you go. Once in a while, step back and view progress from a distance - it’s still not too late to change your mind and plant it elsewhere. For quick growth in pots, up to 2-3’per year, feed your holly any time up until the end of July. After planting, keep the young stem and surround weed free - organic mulches are ideal for this, and they will also feed the holly. Rodents rarely cause damage but do look out for the bark being nibbled away. Once established prune in the winter or early spring - your prunings will make ideal Christmas decorations!! 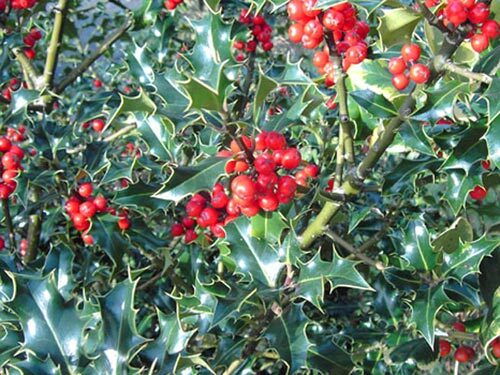 There is lots and lots of holly folklore, so come back once in a while to learn some more. We're approaching the time of year when farmers cut their hedges. Traditionally, famers would never cut down a holly because it was believed that dark witches used the hedges as roads but wouldn't fly past a holly! See “How to Order” for full details. If you want information, or advice, before ordering then ring us or e-mail - we will be pleased to help. If you are uncertain about leaf colour or leaf shape, please email us for a photo! "The Holly arrived yesterday. I was very impressed with the quality and would recommend your nurseries to anyone" D & P, Bolton.
" They were packed well and so received in good condition....they look nice and just need potting into some decorative heavy duty pots which is tomorrow's job! I'll then do the 'wish' thing ....thanks for that kind gesture. Thanks for your good service which will be recommended if the occasion arises". Patti. "Absolutely fantastic plants, very pleased look forward to using you again in the future. Thanks very much" Matt D.
Our special offers vary throughout the year so mark "Welsh Holly" as a favourite and come back regularly to check what is on offer!! We are now on Facebook - please visit our page and like/share us. Look for our contribution to the RHS publication "Britain's Favourite Plants", in which we describe some of our favourite hollies. BBC Gardener's World magazine, Nov 09, included an article on holly - most of the individual holly photos were taken at our nursery!